Dexter's Lodge, still in operation today, once featured an approximately 800' long rope tow that was used primarily by guests. 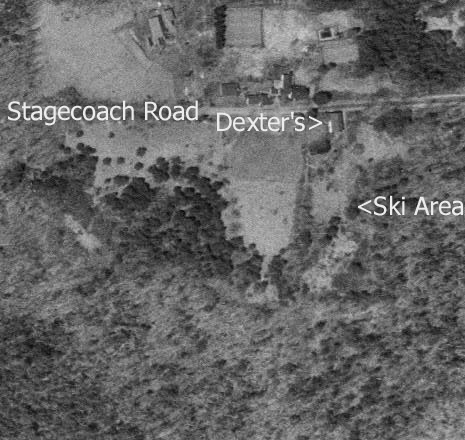 According to a former innkeeper at Dexter's, Mike Durfor, the area had a ski slope and tow on the hill behind the parking lot. It was originally installed in 1948 and last operated around 1970. It was used as a training area before skiers would head to larger areas like Mt. 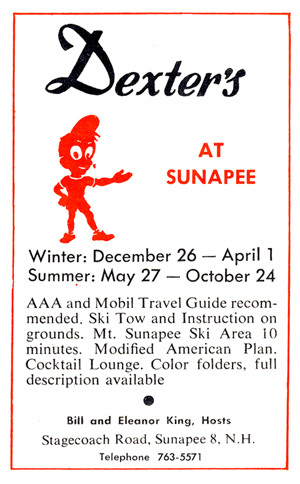 Sunapee. The area was shut down due to liability issues. Dexter's Inn, of Sunapee, NH, which once had both Alpine and Nordic Trails will be opened this year as a Nordic Center. This is the first opening of the trail in some 30 years. We are planning on 15 kilometers of groomed trails for classical skiing and snowshoeing, and will operate Friday through Sunday, as well as on Holidays, once the snow flies. John and Maureen Chiarella of Norsk Ski Center, which formerly operated in New London have been redesigning the trails, and will maintain and groom them. Dexter's Inn will provide the facility, Parking, food, lodging, rentals, etc. This trail map shows the former alpine slope now flanked by cross country trails. For more information on Dexter's, please visit their website. 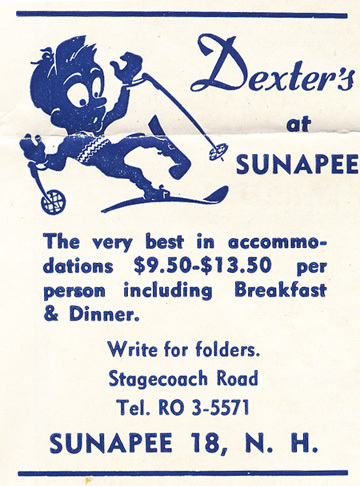 Left - a 1965-1966 ad for Dexter's, from the NH Winter Holidays brochure. A 1998 Terraserver view of the former ski area. Note that portions of the old ski area have grown in.